paste to a small bowl and set aside. *Finely slice the remaining onion into rings or half rings. Heat half the ghee or butter with half the oil in a heavy flame proof casserole and fry the onion rings for 10-15 minutes till they are deep golden brown. Transfer to a plate with a slotted spoon. * Fry the remaining flaked almonds briefly until golden and set aside with onion rings, then quickly fry the sultanas until they smell. Transfer to the plate. *Heat the remaining ghee in the casserole with a further 1 tbsp of oil. Fry the cubed meat, in batches, until evenly browned on all sides. Transfer the meat to a plate and set aside. *Wipe the casserole clean with kitchen paper, heat the remaining oil and pour in the onion, spice and coriander paste made earlier. *Cook over medium heat for 2-3 minutes, stirring all the time, until the mixture begins to brown lightly. Stir in all the additional spices, season with salt and ground black pepper and cook for 1 minute more. *Lower the heat and stir in the yoghurt, a little at a time. When all of it has been incorporated into the spice mixture, return the meat to the casserole. Stir to coat, cover tightly and simmer over a gentle heat for 40-45 minutes until the meat is tender. Meanwhile soak the rice in a bowl of cold water for 15-20 minutes. *Preheat the oven to 160 degree Celsius/325 degree Fahrenheit/Gas 3. Drain the rice, place in a pan and add the hot chicken stock or water together with a little salt. Bring back to boil, cover and cook for 5 minutes. 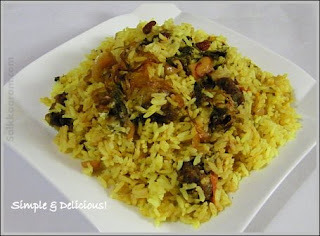 *Drain the rice and pile it in a mound on top of the meat in the casserole. Rice Using the handle of a spoon make a hole through the rice and meat mixture, to the bottom of the pan. Place the fried onions, almonds and sultanas over the top and dot with butter. Cover the casserole tightly with a double layer of foil and secure with lid. *Cook the biryani the preheated oven for 30-40 minutes. To serve, spoon the mixture onto a warmed serving platter and garnish with the quartered hard boiled eggs.